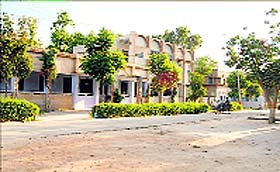 The Rajasthan Government has resolved the dispute over the election of managing committee to run Sri Guru Nanak Khalsa School and Colleges, Sriganganagar. Kamaljeet Kaur, aged about 50, of Batala has not eaten properly for the last almost two months. She is suffering of insomnia and constant headache. Though the Central Government has announced relief for rain-deficit states, official sources say that Punjab’s farmers will gain little from it. The decision to award relief was made by the Union Agriculture Minister in Parliament yesterday. The Government of India has pulled up the Punjab Government for promoting six IPS officers of the 1987 batch one month before they completed the requisite length of service for getting into the next scale. Poverty claimed the life of a 20-year-old state-level woman hockey player from Sunam, Rajwinder Kaur, after her parents expressed their inability to get her admitted to a college outside Sunam with hostel facility. Rajwinder had passed her BA-I examination in April by securing 432 marks out of 800 from a college in Bathinda. With top politicians camping in Talwandi Sabo in connection with the forthcoming Assembly byelection, the place has become a favourite of protesters as it allows them a chance of airing their grievances right into the ears of the persons who matter. Holding a protest at Talwandi Sabo comes with another added advantage - greater media attention. The byelection for the Patiala (Urban) seat is turning out to be a litmus test for senior leaders of all three major political parties. While the Chief Minister Parkash Singh Badal is expected to visit the constituency on August 14 and then after August 17 to address rallies in favour of the SAD-BJP candidate Bhagwan Dass Juneja, Deputy CM Sukhbir Badal is to address three rallies after August 11. Reports of US air strikes on ISIS militants in Iraq today sent the families of Punjabi youths trapped in Iraq into panic. Hira Lal of Amritsar, whose elder brother Sonu was kidnapped along with 40 others in mid-June, said they were disturbed by the turn of events. “I don't know how to handle Sonu’s two sons, aged eight and five, who want to be with their father. The police today denied entry to the members of Namdhari Panthak Ekta Action Committee to a well inside Namdhari Shaheedi Samark. The police said they did so to avert a clash between the warring factions of the sect. The water was needed to fulfil “maryada” of the seven persons who are on hunger strike. The strike — the protesters have been seeking free access to Bhaini Sahib for all the Namdharis — entered its eighth day. The Principal Secretary to the Chief Minister, SK Sandhu, who visited the city today, reiterated the government stand on zero tolerance towards polluting units. The tussle between the local traders and the Excise and Taxation Department officials over penalty on account of alleged bogus billing seems to be unending. Punjab will constitute a task group comprising academicians which will help in policy-making, said Chief Secretary Sarvesh Kaushal at a seminar organised by Institute for Development and Communication here today. There is a ray of hope for patients with recurrent heart ailments. 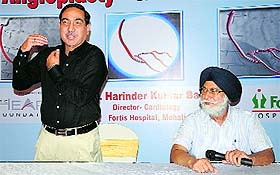 Perhaps for the first time in the country, a team of cardio-vascular surgeons performed ‘Z’-angioplasty on a 69-year-old Chandigarh resident who had undergone two bypass surgeries and had blockage in another artery. With the residents of several villages in Faridkot opposing the disposal of garbage in the open, Ashok Kumar, Secretary, Local Bodies Department reached the city today to placate the villagers. He promised to expedite the construction of a modern solid waste management plant on 18 acres near Bir Chahal village in the district. The project would take care of garbage disposal in 18 municipalities of Faridkot, Ferozepur, Muktsar and Fazilka, said Kumar. Since the prices of poppy husk and drugs have been escalating, drug addicts are now getting hooked on medicines prescribed at de-addiction centres. They are consuming the medicines that are prescribed for three to five days in a day. Around 300-400 drug addicts are turning up daily at the de-addiction centre, Civil Hospital, Badal village. Addicts from as far as Sirsa in Haryana and Hanumangarh in Rajasthan are also thronging the centre. Various farmer and labour organisations today gathered at Attari and protested against the “anti-protest legislation and anti-people policies” of the SAD government. Just about six months after the Punjab and Haryana High Court directed the state of Punjab to frame an "appropriate scheme" for granting financial assistance to farmers, the government today sought an additional three months to come up with a policy on the Andhra Pradesh module. In a first, the Punjab and Haryana High Court has recommended taking over education as an essential state activity to prevent commercial exploitation of students. Justice K Kannan has also ruled that state aid for a private educational institution was not a constitutional necessity. A 17-year-old girl of a remote village in the Baghapurana subdivision was allegedly kidnapped and raped by the kidnapper and his two friends, the police sources said today. An FIR under Sections 363, 366-A, 365, 376 and 120B of the IPC has been registered against Manpreet Singh, the main accused, his mother and his accomplices Satta Singh and Bachi Singh, all residents of Barnala district, for helping him in the crime. A man allegedly axed his wife to death over a land dispute in Chack Balochan village of Fazilka district last night. The police have booked five persons. Balwinder Singh in his statement to the police said his father Balveer Singh assaulted his mother Sheelo Bai with an axe in the courtyard of their house in the early hours. Sheelo Bai died on the spot. Balveer Singh fled from the scene along with the weapon used in the crime. The Rajasthan Government has resolved the dispute over the election of managing committee to run Sri Guru Nanak Khalsa School and Colleges, Sriganganagar. The election was held on April 10. The election of Rajveer Singh of 38BB village as president, Mehal Singh Randhawa of 15FF village as secretary and Jastar Kaur as treasurer has been upheld. Lakhbir Singh Gill of 58RB village has been appointed rector. The warring factions had formed separate managing bodies and submitted respective claims before the Sub Registrar, Sriganganagar. "After examining the constitution, the procedure adopted by the factions, the election of Rajveer Singh and others has been upheld," official sources said. The institutes in question are Guru Nanak Khalsa School, Sri Guru Nanak Khalsa College and Post Graduate College. President Giani Zail Singh was among scores of dignitaries to have visited the institutions. A large number of alumni of these institutions have served as high ranking offices in the state and central governments. They had expressed concern over the tug of war between the two factions for the past five years. About three years ago, the then Superintendent of Police Rupinder Singh had to intervene to prevent a violent clash between the factions. The factions had also planned to hand over the institutes to the Shiromani Gurdwara Prabandhak Committee (SGPC). But the plan was dropped when experts warned that the institutes may lose affiliation with the university and the school may no longer be recognised by the state education board. The rules did not permit bodies from another state to meddle with the affairs of the institutes. The Sikh Sangat had also opposed the move, saying that the SGPC had done nothing to improve the community institutions in the region. The new managing committee today assured to restore past glory and provide a congenial environment for studies. Kamaljeet Kaur, aged about 50, of Batala has not eaten properly for the last almost two months. She is suffering of insomnia and constant headache. It was on June 14 that her son, Dharminder Kumar, had called up from Mosul in Iraq. He broke the news to his family that he along with about 40 more youths had been kidnapped and were being taken out of the town. That was the last time she heard from him. “We are helpless, repenting why we let him go abroad… Why can’t the Punjab Government provide us jobs here?” she said. Several families like hers have now left it to fate after making numerous rounds of the state and Union Government offices. Gurpinder Kaur, sister of kidnapped youth Manjinder Singh from Bhoewal village, said, “We have made all possible efforts for his safe return. We can only pray to the Almighty now. We met Union Defence Minister Arun Jaitley and Union Minister of External Affairs Sushma Swaraj twice. They assured us that the government is leaving no stone unturned to ensure their safe return…But, out wait is not over yet,” she said. A dejected Ranjit Kaur, mother of kidnapped youth Jatinder Singh from Sialka village, said, “We have not heard anything from him since June 15 when he made his last phone call. We are left to inquire about their well-being from anybody who returns from Iraq in our district.” She said the government may have been making sincere efforts, but they would heave a sigh of relief only after their safe return. Till date, 1,450 Punjabi youths have been registered with the state and the Centre as stranded in Iraq. Of them, 906 have returned. The remaining 544 include the 40 kidnapped youths. Sources in the government said the exact number of the kidnapped youths could be 39 or 42, as three cases were yet to be verified. A control room set up by the Punjab Government for receiving information and calls from the kidnapped youths or those stuck In Iraq has not been buzzing much now. While earlier hundreds of calls were received daily, only one call was received today. Harbhajan Lal of Kapurthala called up to request for help to bring back his son, Rakesh Kumar. “He is stuck in Baghdad. How much more time will the government take to bring him back. We read that China evacuated all its citizens within a few days after the crisis erupted,” he said. Officials confirmed that the number of calls on the helpline had come down significantly. They said the reason could be that many of the youths were already back. In terms of political help, the issue was again raked up by Rajya Sabha MP from Punjab Ambika Soni in Parliament yesterday. A Punjab Government spokesperson also claimed that Akali MP and Union Minister Harsimrat Kaur Badal had been following it up regularly with the quarters concerned at Delhi. “She arranged meetings of the families of the kidnapped youths with Finance Minister Arun Jaitley and External Affairs Minister Sushma Swaraj,” the spokesperson said. The relief will be given up to 2 hectares (or 5 acres) per farmer as subsidy on diesel at Rs 1,050 per hectare. This comes to Rs 420 per acre. A farmer owning 2 hectares will get Rs 2,100. There are 3.5 lakh farmers in Punjab who own land up to 2 hectares. It is clear that relief will not be given for the entire area under crops. A drum (200 litres) of diesel in Punjab costs about Rs 11,500. The money will be disbursed by the state government. The state government will send a bill to the Centre which will reimburse the amount. The state government will give a matching grant to the farmers. Officials sources said the relief would be given for the post July 15 period. Areas where the rain deficit was less than 50 per cent would not be given any relief. Though Punjab’s average rain deficit is more than 50 per cent, in some pockets it has been less than 50 per cent. Farmers in the state started transplanting paddy after June 10. The period from June 10 to July 31 was most critical as the farmers had to use diesel to operate their tube wells to transplant paddy. The Centre has announced a hike in subsidy for wheat seed from Rs 1,000 per quintal to Rs 1,500 per quintal. The seed is available at Rs 2,200 per quintal in the market. After getting the seed at a subsidised rate of Rs 700 per quintal, it may be resold in the open market to flour mills. The Centre has announced some relief on green fodder too. But the allocation is negligible. Punjab had sought Rs 2,330 crore as drought relief. Chief Minister Parkash Singh Badal had met the Union Agriculture Minister on Monday in this regard. In 2009, the Manmohan Singh Government had announced Rs 800 crore for Punjab as drought relief. Of this amount, Rs 200 crore was distributed among the farmers and the remaining sum was retained by the state government on the plea that it had spent an additional amount on free power to the farmers. Sources told The Tribune that the Department of Personnel and Training, Government of India, has sent back the file of those officers saying they could be promoted into the next scale only after they had completed 25 years of service. The officers are: Dinkar Gupta, CSR Reddy, MK Tiwari, GS Sahota (now retired), Rajpal Meena and VK Bhawra. VK Bhawra, when contacted, said he joined his new posting the day the government issued orders for his new assignment in the higher scale. Other officers could not be contacted for their comments on the issue in spite of repeated attempts to contact them on the phone and through SMSes. The six officers completed 25 years of service on December 31, 2011, thus becoming eligible for promotion on January 1, 2012. However, they were promoted with effect from December 1, 2011, by the state government. Sources in the Personnel Department said according to rules, an IPS officer could be promoted as the Deputy Inspector General of Police after completing 14 years of service, and to the post of Inspector General of Police after completing 18 years of service. An officer can be elevated to the rank of Additional Director General of Police after completing 25 years of service and as the Director General of Police after completing 30 years of service. Sources in the Punjab Government said they were now examining the communique received from the Department of Personnel and Training and would soon decide on how to proceed in the case. Rajwinder “committed” suicide by jumping in front of a passenger train about 6 km away from Sunam four days ago. She was upset that due to poverty her parents could not get her admitted to a college where she could improve upon her hockey skills and fulfil her dream to play for the nation. Her father is a daily-wage earner, while her mother is an agriculture worker. Rajwinder’s two elder sisters are married and her brother (17) is a student of Class XI. 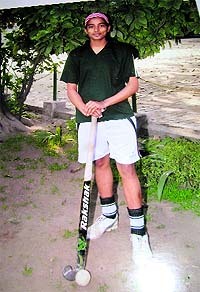 Rajwinder had participated in under-20 Junior National Hockey Championship held at Pimpri (near Pune), Maharashtra, in 2010. She also participated in the Pepsu Women Hockey Association Tournament-2011, the Punjab Raj Mahila Khedan (Hockey) held at Bathinda in October 2013. She also took part in the Punjab State School Games (Hockey) four times, representing Sangrur and Ludhiana districts. the family had ever thought that she could take such an extreme step as she was a bold girl. Her unofficial coach at Sunam said Rajwinder was a committed player who never hesitated from practising even with male players. He said she was in Class VI when she started playing hockey under his supervision. Since then, she never saw back and went on to play at the state and national level for Punjab. No wonder then, PRTC employees, members of the National Rural Health Mission (NRHM) workers' unions, ETT Teachers and farmers have been holding protests in support of their demands at Talwandi Sabo these days. However, Talwandi Sabo residents are facing difficulties due to these protests. Unruly scenes are often witnessed whenever the police try to round up or disperse the protesters. Today, some protesting nurses fell unconscious near the old bus stand. They were taken to the Civil Hospital for treatment while others were arrested. Congress leaders, including PPCC chief Partap Bajwa and party candidate Harminder Jassi, criticised the police action against protesting nurses. The protesting teachers, nurses and PRTC workers have been camping in the city for the past one week to lodge their protest against non-acceptance of their demands. Such protests are, however, not going down well with SAD-BJP leaders. Heavy police force has been deployed in the area to keep protesters under check. 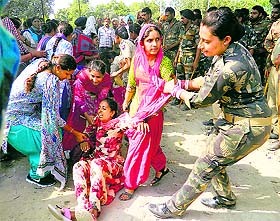 The police thwarted a protest march by unemployed ETT teachers, PRTC workers and rounded up over 100 nurses. Members of the National Rural Health Mission Employees Association and the Contract Multipurpose Health Workers (Female) Union raised slogans against the state government at the old bus stand today. The agitators were rounded up and taken to various police stations and cases registered against them. Besides nurses, fresh cases were also slapped against PRTC workers. "We decided to take out a protest march in the city holding black flags. The police tried to stop us, leading to a chaos," said Navneet Kaur, state president of the National Rural Health Mission Employees Association. Ninder Kaur, state president of the Contract Multipurpose Health Worker Union, said they were protesting against the delaying tactics of the state government in regularising NRHM workers. "While states like Rajasthan, Tamil Nadu and Andhra Pradesh have amended their policies to provide better perks to our counterparts there, nothing has been done by the Punjab Government," she said. The protesters said the state government had even failed to implement its own notification regularising 1,151 ANM nurses. Bathinda SSP Gurpreet Bhullar said protests could not be allowed in the area in view of the election code of conduct. "Yesterday, three policemen were hurt after being hit by stones hurled by protesters. We have registered cases against some protesters," he said. Akaili leaders Surjit Singh Rakhra, Daljit Singh Cheema, Parminder Dhindsa, Prem Singh Chandumajra, NK Sharma and Hira Singh Gabria have been actively canvassing for Juneja. State BJP chief Kamal Sharma met the local cadre a couple of days ago to ensure that they worked hard for Juneja's win. Former CM Capt Amarinder Singh will be spearheading the Congress campaign from tomorrow. He wife Preneet Kaur is in the fray. He will camp in Patiala till the polling day. This will be one of his longest stays in the town in the past few years. He will be assisted by a battery of 29 MLAs and 10 former MLAs. 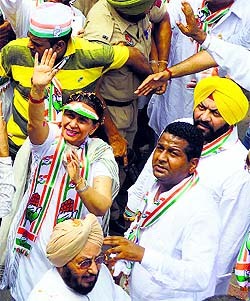 Despite some fissures in the Congress, the mood in the party camp is upbeat. Senior AAP leaders Arvind Kejriwal, Yogendra Yadav and party MPs will canvass for Harjit Singh Adaltiwala. The party's Lok Sabha candidate from Bathinda, Jassi Jasraj, visited Patiala earlier this week. He participated in a roadshow. Senior party leader Sucha Singh Chhotepur was in the town today. He addressed public meetings apprising the people of AAP policies. He highlighted the "misdeeds" of the SAD-BJP alliance as well as those of the Congress. Capt hits out at Badals over I-Day function venues Congress Deputy Leader in Lok Sabha Capt Amarinder Singh on Friday took strong exception to Chief Minister Parkash Singh Badal and his deputy Sukhbir Badal planning to unfurl the national flag on August 15 at Patiala and Bathinda. He alleged the father-son duo had chosen these venues with an eye on by-elections in Patiala and Talwandi Sabo. He sought attention of the EC, claiming this amounted to "serious violation of the code of conduct". Bajwa asks cops not to follow 'illegal' orders Punjab Congress president Partap Singh Bajwa on Friday called upon the policemen in the state to listen to their conscience rather than following the illegal and flawed orders of the Akali rulers. It was perhaps for the first time that the police was being misused to this extent by the rulers for their vested interests, he said. Country has rejected Congress, says Badal Chief Minister Parkash Singh Badal on Friday asked voters in Talwandi Sabo to realize that the entire country had rejected the Congress for its failure to deliver the results according to public expectations. We were hoping that all kidnapped youths would be released soon. The US action has destroyed all hope,” he said. He was angry with the Indian Government. “I wish the Centre had shown greater haste in rescuing the youths. They should have been home by now,” he said. Parminder Singh of Hoshiarpur said his elder brother Kamaljeet was among those kidnapped by the militia in Iraq. Reports of the US military action against Iraq had thrown them into despair, he said. Suggesting a peace formula, the committee demanded that Mata Chand Kaur, wife of late sect head Jagjit Singh, should take over the working of the sect in her hands. “She should call ‘sarbat khalsa’ where all the devotees may gather to sort out the issues of successor and possession of property,” said Navtej. Sandhu reached the Leather Complex at 7.30 pm, keeping noted environmentalist Balbir Singh Seechewal and others waiting for more than three hours. He said none of the units polluting the Kala Sanghian drain would be spared. “Since 2008, the government has failed to check the flow of effluents into the Kala Sanghian drain. The 50 MLD plant built near the Leather Complex to treat drain water is not working to capacity... It is strange that the officials chose to hold a meeting with the Cooperative Society first. I wonder if that was more important than the threat to public health posed by the polluted waters,” said Seechewal. The Principal Secretary shall be holding another meeting at the Leather Complex tomorrow. The Punjab Excise and Taxation Officers and Inspectors Union today threatened to stop work at all the 39 Information Collection Centre (ICC) barriers across the state if the state government failed to act against the erring traders allegedly involved in bogus billing by Monday. The excise officials alleged that the traders who had been nailed in inquiries were now flaring up the issue to escape penalty. The traders, on the other hand, have been contending that they had been slapped “unreasonable penalties”. On August 5, the traders had created uproar outside the office of Excise and Taxation Officer (ETO) Amit Sareen even as the department officials claimed the penalties were “genuine”. Following the protest by traders, the ETO Union had announced a pen down strike. The traders are up in arms against Sareen. Additional Excise and Taxation Commissioner Shiv Dular Singh Dhillon yesterday visited the city and has initiated the investigation into the issue. He had recorded the statements of traders while the version of the excise officials was yet to be heard. “Whatever penalties have been levied on the traders are as per law. We demand action against the traders who abused us during their protest on August 5. We also demand that none of the traders who have been fined for bogus billing should be exempted from the penalty. If the government does not fulfill our demands by Monday, we will shut all the 39 ICC barriers across Punjab,” Surinder Singh Rubby, union president, said. Amit Sareen, union general secretary, said though they would sit at the ICC barriers, they would not stop any goods vehicles for updating tax information, which would mean losses worth crores to the exchequer. On an average, the ICC barriers add around Rs 20 crore to the exchequer in the form of taxes by updating the inflow of goods from other states to Punjab. He said the government needed the assistance of scholars in social sciences to carry out research on the problems that the public faced at the ground level before drafting citizen welfare-oriented policies. He said that in most universities of the state, there was little focus on research. Indian Council of Social Sciences Research chairperson Prof SK Throat argued that there was no institute in Punjab that could undertake research on the problems of citizens. The Institute for Development and Communication director, Dr Parmod Kumar, said most scholars did not want to experiment because of which there was little quality research in the country. Prof BS Guman, Panjab University, gave a presentation on how to improve research. During the discussion, it was brought to light that 90 per cent of the budget allocated by the government went into paying salaries to employees owing to which no institute could spare funds for the infrastructure required by the scholars. One of the faculty members pointed out that in the eighties, the Punjab Government would purchase research papers for Rs 2,000 and utilise these for the welfare of the public. He asked why this practice could not be revived by the government now. He was operated upon with the help of a new technique and the blockage removed. Daljit Singh, a retired government official, had earlier undergone bypass surgery in 1988 at a Chennai hospital for triple vessel coronary artery disease. He underwent another bypass surgery in 1999 at a Delhi hospital for blocked bypass grafts. "An angiography revealed critical narrowing of blood vessels (stenosis) in one of the coronary arteries. There were multiple acute sharp obstructive bends (angulations) through which negotiating coronary balloons and stents was almost impossible,” explained Dr HK Bali, interventional cardiologist, Fortis Hospital, Mohali. Dr Bali and his team performed angioplasty and relieved the stenosis, thus restoring the blood flow to the vessel. “We used two medicated stents to treat the block. An innovative technique was used to treat this extremely complex disease,” said Dr Bali. The procedure, done under local anaesthesia, took 30 minutes, he said. Residents of Machaki Khurd, Burj Masta, Arianwala, Jhotiwala, Midmaan and Himmatpura villages in Faridkot district stopped the municipal committees in the district from disposing garbage on a four-acre dumping ground near Machaki Khurd village. They said the disposal of garbage in the open posed several health hazards. 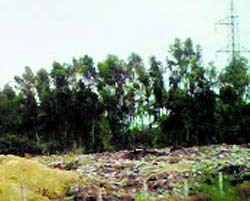 Faridkot municipal committee had been dumping garbage near the village for over five years. In Kotkapura, the municipal committee had started dumping garbage into dry ponds of the city after residents of Sikhanwala village began opposing the disposal of garbage in the open. With no alternative in sight, the Local Bodies Department has now set the ball rolling for the construction of a modern solid waste management plant near Bir Chahal village. "The plant will help in coping with the huge quantity of solid waste being generated in the region," said Kumar during his meeting with the local authorities. The secretary also assured the residents of villages adjoining the proposed solid waste management plant that the plant will not pollute the environment. the medicine," says Subhash, an addict. Dr Rohit Jindal, psychiatrist at the Civil Hospital, said, "We do not hand out the medicine to anyone who comes here daily." The state had sought three months in May as well. The initiative is aimed at tackling the issue of suicide by farmers. As a petition filed by the Movement Against State Repression came up for resumed hearing, the state told the Bench headed by Acting Chief Justice Ashutosh Mohunta that it was in touch with the Andhra Pradesh and Maharashtra governments and had requested for details. The state had earlier informed the High Court that the government had decided to formulate a scheme on the Andhra Pradesh pattern for granting financial assistance to the families of debt-trapped farmers who had committed suicide. An affidavit to this effect was filed by the Secretary, Agriculture, Kahan Singh Pannu. The ruling came on a petition by Pathankot-based private college SRPA Adarsh Bhartiya College for directions to the state to release grant-in-aid “in the same manner as it has been done for another college in Dhuri”. Justice Kannan asserted: “There are several private institutions which thrive in a market where supply is lower than the demand. All that the courts have overseen in such a situation is to ensure that there is no commercial exploitation of students and the managements that set up schools or colleges do not secure capitation fee to run the administration.